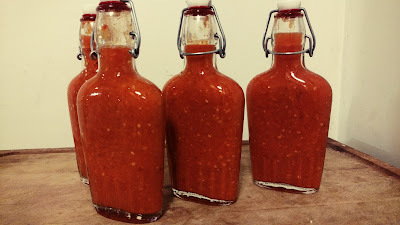 I've made hot sauces before, but haven't ever really been pleased with them, as the vinegar seems to wash out a lot of the natural flavor of the peppers. So at the end of October, with the farmer's market season on a week or two away, I came across a late flush of hot peppers. There were beautiful Hungarian carrot peppers, plus a good number of red serrano peppers for sale. I picked up both and thought it was time to give homemade hot sauce another swing. 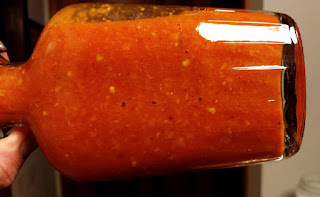 Following this blog article, I split and gently crushed the peppers into the bottom of a glass jar, along with star anise and fresh garlic. I topped the peppers up with salted water, then inoculated the peppers with a ladle full of the juice from my fermenting sauerkraut crock. After about 2 weeks the peppers had softened and began to gently bubble. All the while the peppers kept a bright, fresh aroma. At the six week mark I decided it was time to get my sauce on. I pureed the chilies into a mash, then added some more fresh garlic. The pepper mash was thick, so I thinned it out into a pourable consistency with the fermenting juice. The hot sauce came out with a super vibrant flavor, some garlicky undertones, and a searing heat in the end. For a first time making lacto-fermented hot sauce, I can't see doing anything else in the future.